Agencia is a simple and creative WordPress agency theme from Theme Junkie developer club. This theme is specially designed to use for all kind of creative business websites. It could be used for agencies to showcase their services, freelancers to display about portfolio, work, showcase photography and anything that you plan to create for your client/customers. Agencia WordPress Theme is a very clean responsive web design that supports to work on all responsive devices like Mobile, Tablet, and modern browsers. 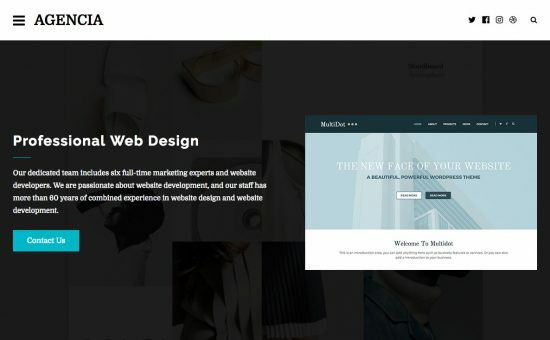 It is 100% easy to customize and design a unique web page design for you! It comes with features like the latest work, showcase services, social media posts, testimonials and etc.! Agencia WordPress Theme is basically a clean coded and not glutting design! With the help of Page builder plugins, you can create an unlimited unique design for homepage, portfolio, services and landing pages! Agencia theme is compatible with popular pages builder plugins like Elementor, Divi, SiteOrigin and Beaver Builder. Learn more about these page builders check here!